Rome is prized for its dedication to delicious food. There are many fantastic restaurants scattered across the city. Choosing one can be hard. These 7 listed are the best of Rome, with food to die for and views to match. Ever wondered where the gourmands, the haute cuisine critics, the celebrities eat when they come to Rome? Each of these 7 fine Michelin-starred restaurants brings something unique to the table, whether it be a style of cooking, a fantastic view, an unforgettable ambience, or, in many cases, all three. They are sure to make for a wonderful visit to Rome. Rome is not a city for a one-day visit. If you want to make sure you will also match the perfect accommodation for your haute cuisine exploration, check our handpicked selection of 5 best hotels in Rome! La Pergola is dining at its absolute finest. An unparalleled view across Rome. A wine cellar with 53,000 bottles. 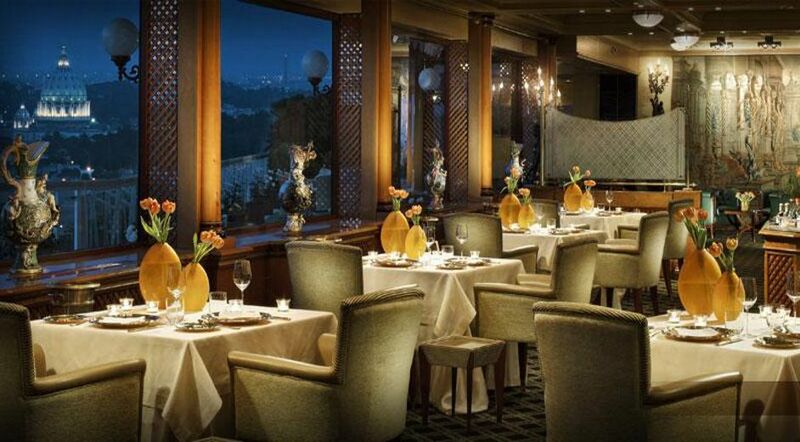 Situated inside the 5-star Rome Cavalieri Hotel, this restaurant could double as a museum in any other context. Rare tapestries, paintings, sculptures, and blown glass give the restaurant an atmosphere of class, luxury, and excellence. Rated 3 stars in the Michelin guide, La Pergola is routinely voted the best in Rome, one of the best in Italy, and one of the best in the world. This 2 star restaurant located near the Tiber in the heart of the city focuses on modern, stimulating cuisine. Though many dishes are based on Italian classics, you may not recognize them as such. The dishes are arranged with the utmost care; it seems almost a crime to ingest such works of art. Almost. Oliver Glowig is a German chef with 2 Michelin stars who is able to combine precision and discipline descending from his origin with Italian creativity and inventiveness in the cuisine. 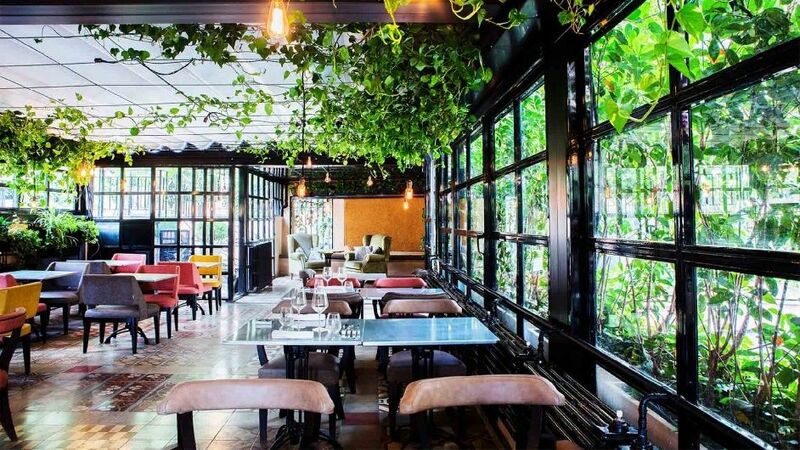 Recently opened restaurant in Rome with its captivating name la tavola, il Vino, la dispensa will embrace you with its best regional italian specialties blends with creativity. Located next Rome’s Termini railway station entrance on Via Giolitti it offers suggestive view of the “Mercato Centrale” from the first floor. And if you combine it with a stay at the classic five star boutique hotel Villa Spalletti Trivelli near Fontana di Trevi, your Roman holiday will be truly complete. A 1 star restaurant, Acquolina specializes in seafood and fish. Seafood is used in unique ways here; unusual ingredients are employed to make the most of their freshly caught fare. Consistently one of the best seafood restaurants in Rome, Acquolina Hostaria goes to great lengths to expose your palate to the full brunt of what the sea has to offer. At Michelin starred AROMA at Palazzo Manfredi you will give you the most magnificent view of this magical city - the Colosseum view! The restaurant has only 28 seats – a perfect environment for your romantic dinner or private party. You can look forward to appetizers with lesser known species along with five varieties of pasta and meat options. All local produce. Recently awarded with Michelin star, the young chef Marco Martini offers in his restaurant at the boutique hotel The Corner a haute cuisine ’based on his memories‘. You will be amazed by his cooking talent respecting seasonal products, rooted in the tradition of Roman cuisine, with his touch of a modern twist. Located only a 10-minute walk from Colosseum on Viale Aventino. Image of the restaurant below. Rome is full of restaurants with great views and great cuisine, but very few combine the two in so effective a way as Imàgo. Great swathes of glass give a fantastic panoramic view of Rome. A great culinary staff serve up a memorable meal, made to the highest standards.